The Reigate Marble Shop Ltd - Bathrooms, Bedrooms, Kitchens, Tiler - Tiling based in Reigate, Surrey. 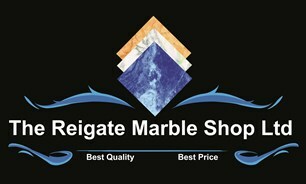 The Reigate Marble Shop LTD. Established in 2005, The Reigate Marble Shop Ltd is a family run business with over 15 years' experience in Natural Stone ,Quartz and Solid Surface Corian in the UK and Abroad. We also supply Sinks, Hobs, Fridges, Taps etc. You will find some examples of some of our past projects in our Albums. Should you have any projects or queries in mind, please do not hesitate to call us on 01737 221261. Or visit us at our showroom at 7 Prices Lane, Reigate, Surrey, RH2 8BB, where we are opened Monday – Fridays 9am - 5 pm and Saturdays 10am - 4pm. We cover a wide area in the South East which includes, Surrey, Kent, Hampshire, London, West Sussex, Berkshire, East Sussex, and further afield, Birmingham. Surrey, East Sussex, West Sussex, Kent and London.